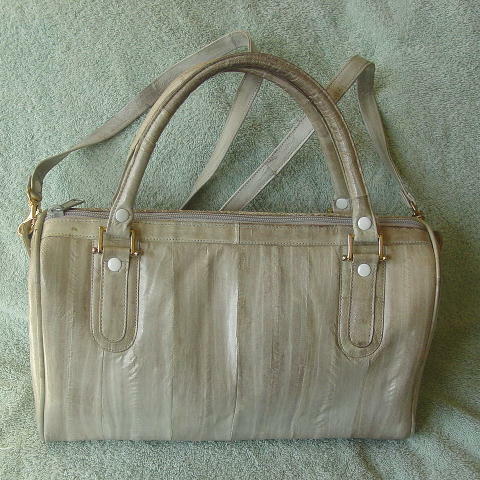 This vintage eelskin doctor's bag style purse is in multiple tones of an oyster color. It has two 13 1/2" long padded eelskin handles and a detachable 37" long by 9/16" wide shoulder strap. There are little round white accent brads on the strap, handles, and tabs holding the handles. The interior is in a bone suede and the deep zippered interior pocket is lined in a tone-on-tone multi-tone dark sand color fabric. 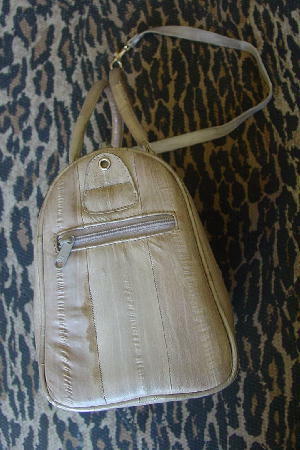 It has 4 little gold-tone feet on the bottom and one side has a small zippered pocket.